The Gorkha Janmukti Morcha has said it will start a fast-unto-death agitation in Delhi to pursue the demand for a Gorkhaland state even as it asked the West Bengal government to refrain from creating obstructions. 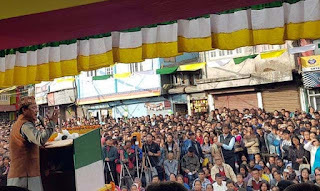 The announcement was made by GJM president Bimal Gurung at a public meeting in Kurseong, which was part of the political activities that started earlier this month in Mirik for the statehood demand. “I have already spoken to Union home minister Rajnath Singh and apprised him about our demand and the slew of activities we have lined up. As I have announced earlier, all our political activities with regard to our demand will be focused in Delhi,” said the GJM chief on Sunday. Gurung recently announced his party's plan to stage a dharna at the Jantar Mantar from December 12 to 16 on the statehood demand. And on Sunday, he made a fresh announcement of also starting a fast-unto-death agitation coinciding with the dharna. “Besides the dharna, we will also observe a fast unto death programme. This is our ultimate fight for our rightful demand and we will utilize every available measure to achieve it,” he said even though he did not say if he would also be participating. All Gorkhaland Territorial Administration (GTA) sabhasads (the elected 45), municipality councillors, the party’s frontal organisations and the three hill MLAs have been asked to participate in the Delhi programme. Gurung also made it a point to deride the hill TMC, which is making significant inroads, by highlighting the Gorkha National Liberation Front (GNLF) as the main opposition. “The TMC does not have any presence and significance in the hills. It is alive only because of the district administration with whose help it carries out its activities. The GNLF though, can be considered as some semblance of the Opposition,” the GJM president said. With chief minister Mamata Banerjee doling out development boards for the various communities of the hills, considered a divisive ploy by the GJM, the TMC has managed to make its presence felt. Bolstering the TMC mood is the defection of numerous GJM activists into its fold. In fact, the TMC has said it will contest the panchayat, municipality and GTA elections. Wary that the chief minister may try to disrupt the party's activities, Gurung asked Banerjee not to be an impediment to their rightful demand. “We have nothing to do with Bengal as it is not in any position to create a separate state. We will not talk to them on this matter. We however request them (the CM and the state government) not to try to create obstructions,” Gurung said. Dwelling on the recent meeting with the union home minister in Delhi, Gurung said he has invited Singh to Darjeeling to inaugurate two parking facilities and three model schools in Kurseong. “I have invited the union minister to inaugurate car parks and model schools developed by the GTA. All funds related to the projects have come from the central government under the special package scheme for the hills,” he said.